*** Fully welded pass throughs for pharmaceutical and aseptic manufacturing applications are available here. 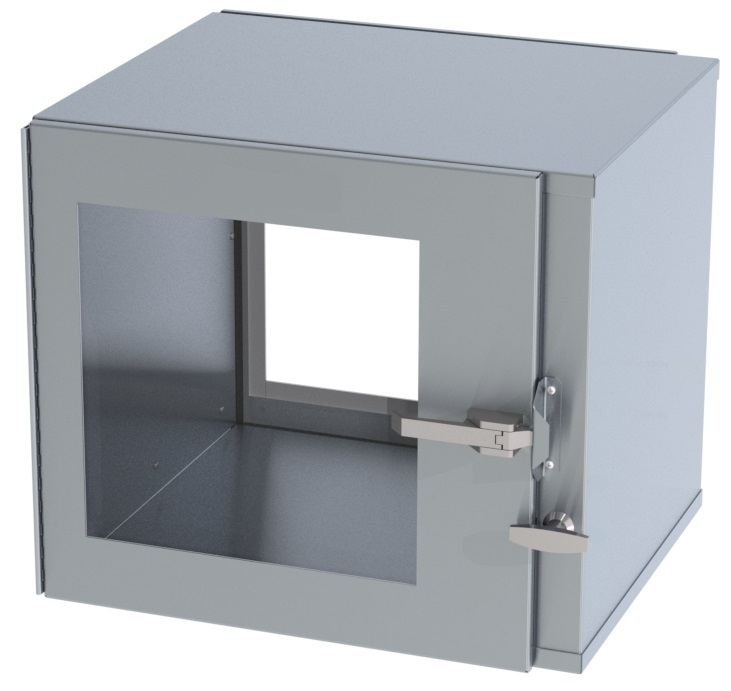 This pass through window is constructed with a formed and stitch-welded type 304 stainless steel with a #4 finish, making it strong, sturdy, and easily cleaned while providing a superior look to your cleanroom. The all metal construction free of particle board also provides the durability to resist the warping, cracking, or chipping characteristics of formica which could then lead to the growth of biological contamination. The doors are made with a heavy duty stainless steel frame, stainless steel continuous flush-mount hinges, clear tempered safety glass viewing window, silicon bulb gasket, and Type 316 stainless steel lever compression door latches. The stainless steel frame adds strength and prevents cracking of the safety glass, a common problem with frameless doors. *** The below pass thrus now come standard WITH mechanical interlocks and trim kits.